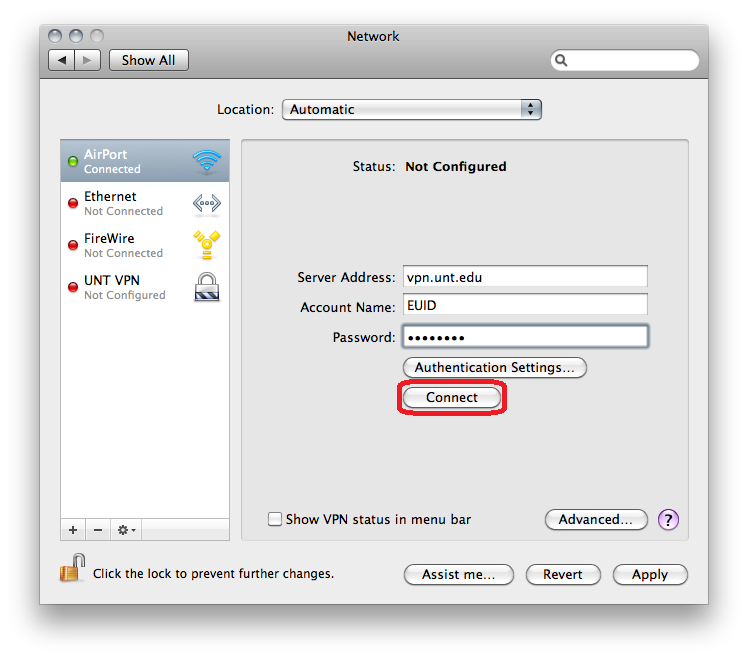 Download "UNT System Campus VPN Guide"
3 Introduction This is a guide on the different ways to connect to the University of North Texas System Campus VPN. There are several different methods of connecting to the VPN that this guide will discuss. Each method accomplishes the same goal just in a different way, which allows the users more flexibility. This flexibility is important since we have a wide range of users that have different needs and different hardware requirements. The UNT System Campus VPN is a device that will allow you to connect remotely to on-campus resources. This will allow employees and students of the University of North Texas to work from off campus using resources they otherwise couldn t access. The connection from the user machine to the Campus VPN is an encrypted connection which allows us to securely allow access to resources we otherwise wouldn t allow. As stated above there are three different methods to connect to the Campus VPN. Each method is available for all employees and students of the University of North Texas. There may be a preferred method that your network manager or teacher would like you to use, so it s always best to discuss the issue with them first. The first method is the web portal. 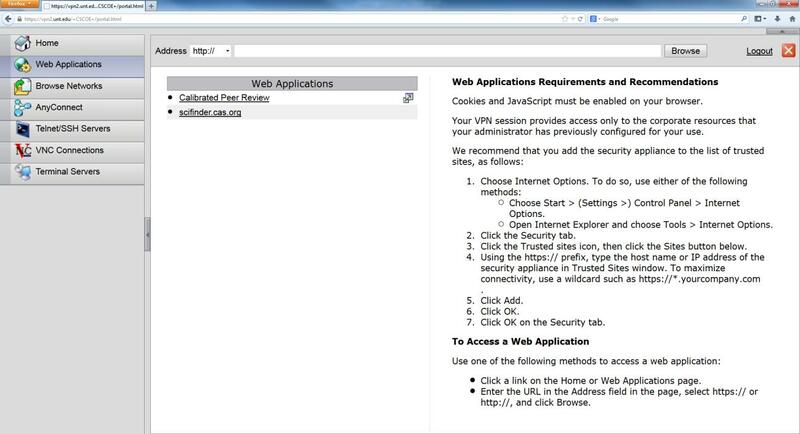 This is a SSL web page that acts as a proxy server to the on-campus resources. This will allow access to the on-campus resources from machines that you might not want or need to install a client. This way uses SSL and Java to accomplish this goal. The second method is the AnyConnect client. This is an ActiveX or Java client which uses SSL protocols to setup an encrypted connection to the Campus VPN. The AnyConnect client gives the user a UNT IP address making their machine logically part of the network. Only traffic going to the University of North Texas will use the encrypted tunnel. All other traffic will not be encrypted and use your normal internet provider connection. The final method is the IPSec client. This is a client that uses the IPSec protocols to connect to the Campus VPN. The official IPSec client is downloadable from: You will need to use your EUID and password to download it. Any third party IPSec client that uses the standard IPSec protocols should work, however they may have problems which may not be supportable. Just like the AnyConnect client this method will also give the user a UNT IP address. It will also only use the encrypted tunnel for traffic going to the UNT like the AnyConnect client does. Just like the AnyConnect client all other traffic will use your normal internet provider connection. 4 SSL Web Portal The web portal is the easiest way to connect to the Campus VPN without having to install a client on your machine. 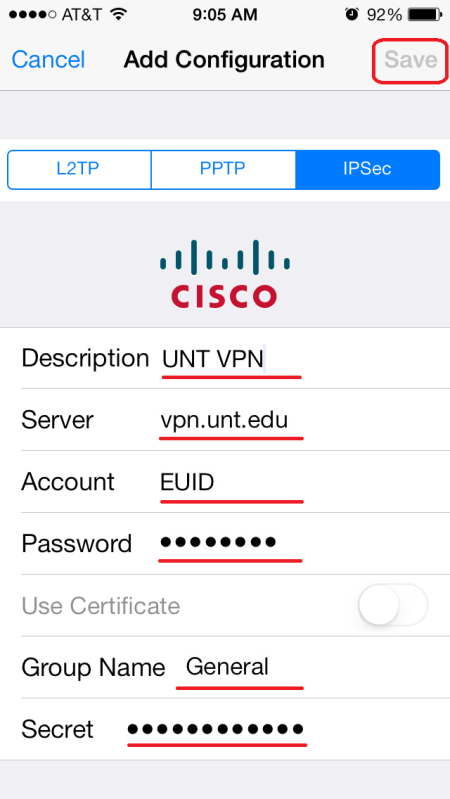 Just point a web browser to: vpn.unt.edu You will have to accept the certificates first and you can setup a permanent exception so you only have to do this once. To login you will need to enter in your EUID and password. After that the computer usage policy will appear. You will have to accept the policy before you can continue on to the web portal home page. 5 Once you accept the computer usage policy you will be taken to the web portal home page. From this page you can go to the different areas of the web portal by using the menu to the left or the pull down menu show below. The first menu item is for web applications. This is where you can use the Campus VPN as a web proxy. On the right side of the page you will see instructions on how to use this function. Just enter in a web address in the address bar and hit enter or the browse button. 6 The Campus VPN will then browse to the webpage. Once you are at the webpage you will notice two strange things. The first thing is the address in the URL bar. You will notice that it has the Campus VPN address first then the webpage where you are. 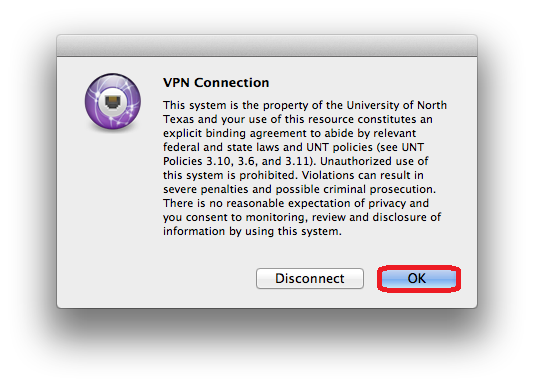 This is because you are using the Campus VPN as a proxy, piping the webpage through the Campus VPN. The second thing you will notice is the strange menu bar on the top right side of the screen. From left to right this menu will allow you to switch the menu to the other side, enter in a new address, go back to the web portal home page, and logoff the Campus VPN. If you hit the new address button it will pop up a window that you can enter in a new web address. The next menu item is the browse network page. This page will allow you to browse network shares and files. 7 Enter in the network share location into the address bar and hit enter or the browse button. This will bring up the network login screen shown below. Your network manager or teacher may have to give you access to the network share you are trying to access. Once you have access enter in your username and password for that network share. 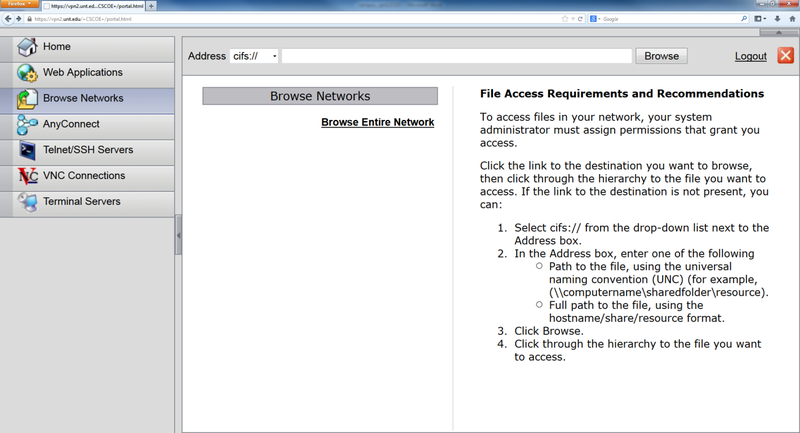 After you login, you will be able to browse the network share and access the files. Below is what the page will look like without any network folders or files. The third menu item is the AnyConnect page. From this page you will install the AnyConnect client on your machine. We will discuss the AnyConnect client and the installation later on in this guide. 8 The next menu item is the Telnet/SSH page. This page will allow you to telnet or SSH to servers on campus. 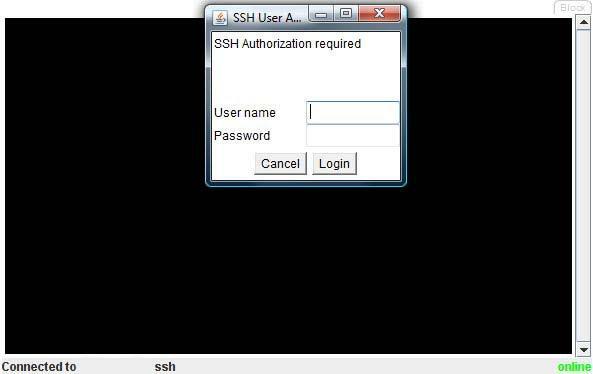 Just like all the other pages, just enter in the server address you are trying to SSH or telnet to in the address bar. After you enter in the server address and hit enter a java applet will show up on page. Once it connects to the server you will get a login screen shown below. Enter in your username and password for that server and you will be logged in like normal. 9 The next menu item the VNC connection page. 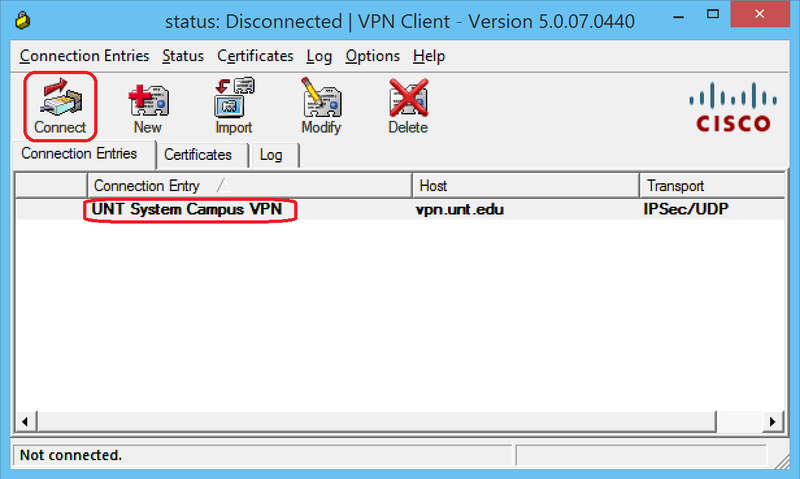 This page allows you to use the Campus VPN as a VNC proxy. Once you enter in the address of the machine you are trying to VNC to you will be taken to a new page. The new page uses a Java program called TightVNC as shown below. Once TightVNC connects to your VNC machine you will need to login as normal. 10 The final menu item is for terminal services usually called remote desktop. This page allows you to remote desktop to machines on campus that would otherwise be blocked from the outside. After you enter in the address of the machine you want to remote desktop to, a page like the one below will appear. This page is showing that it s trying to connect to the machine you have entered. 11 Once connected, the Campus VPN will pop up java window showing your remote desktop connection to the machine. Below is an example of the remote desktop window. 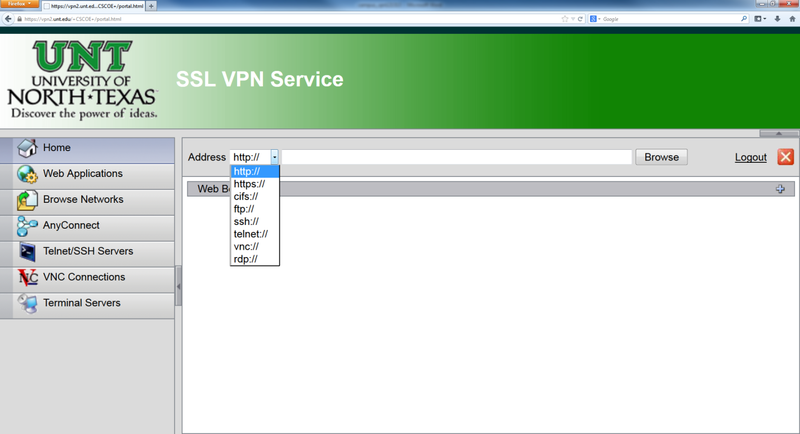 That is all the features of the Campus VPN web portal. The web portal is the easiest and fastest way to connect to on campus resources without having to worry about installing any software. It provides a secure encrypted connection from your machine to the resources you are accessing. 12 Installing AnyConnect VPNClient As discussed earlier the AnyConnect client is an ActiveX or Java client that uses the SSL protocols to make an encrypted connection from your machine to the Campus VPN. 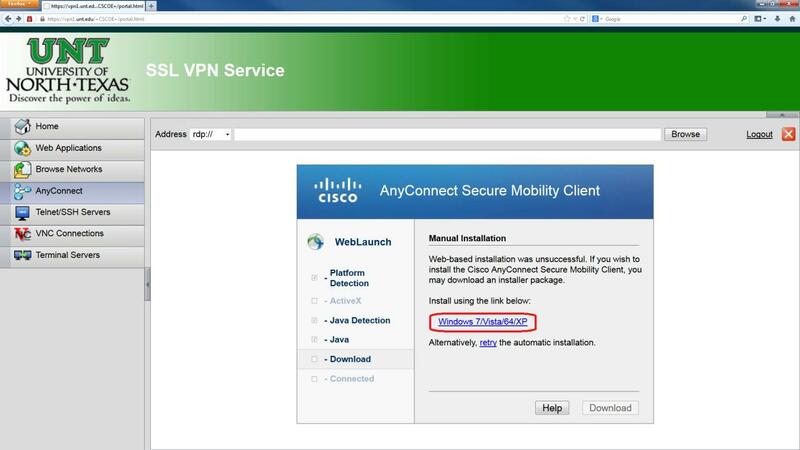 To install the client you need to login to the Campus VPN web portal. If you need help logging in, please read the above section titled SSL Web Portal. 1. Select AnyConnect on the left navigation pane. Then, click Start AnyConnect. 13 2. An installation window will appear. If Java is installed on your machine, you may follow the automatic installation prompts. 3. If the automatic web install fails for any reason, click on the Windows 7/Vista/64/XP link. You may either install directly or save the installation file. 14 4. Launch the AnyConnect installation. Click Next. 5. 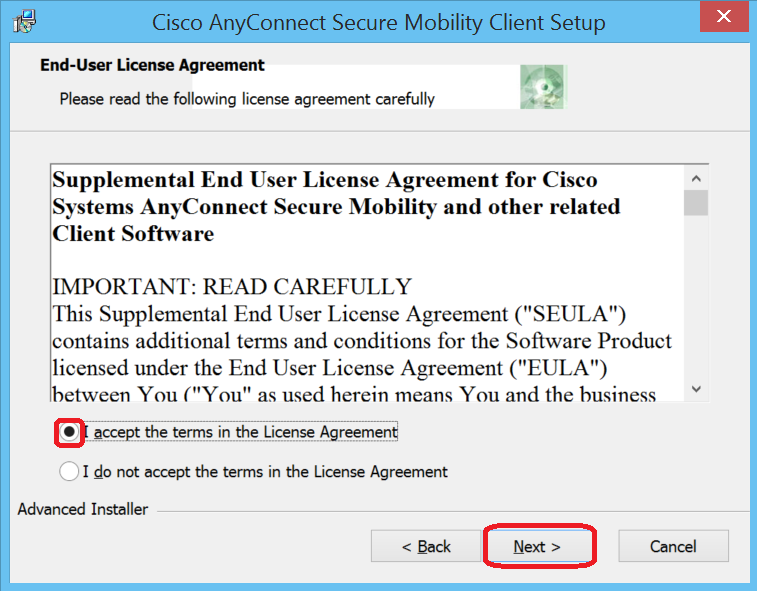 Click on the button for I accept the terms in the License Agreement. Then, click Next. 15 6. Click Install. 7. It will take a few seconds for the installation to finish. Then, click Finish. 16 Connecting AnyConnect VPN client 1. 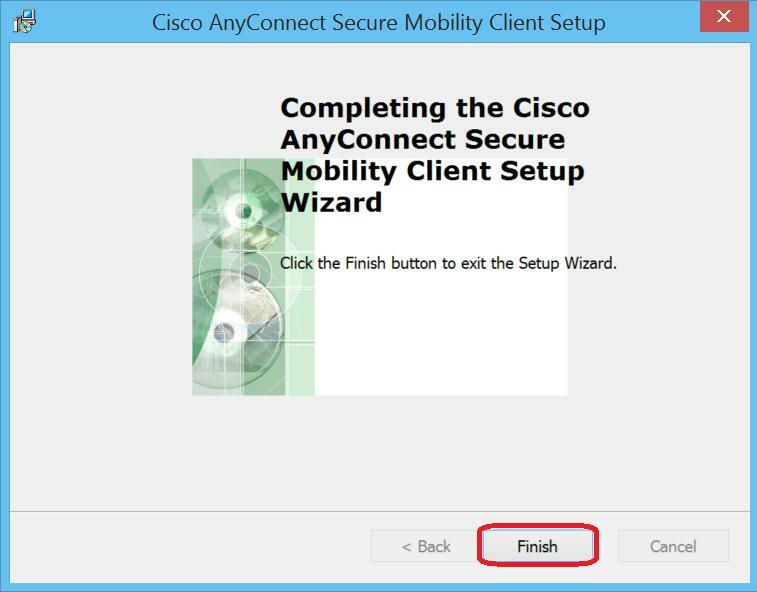 Select the Cisco AnyConnect Secure Mobility Client from the Metro or Start menu. 2. 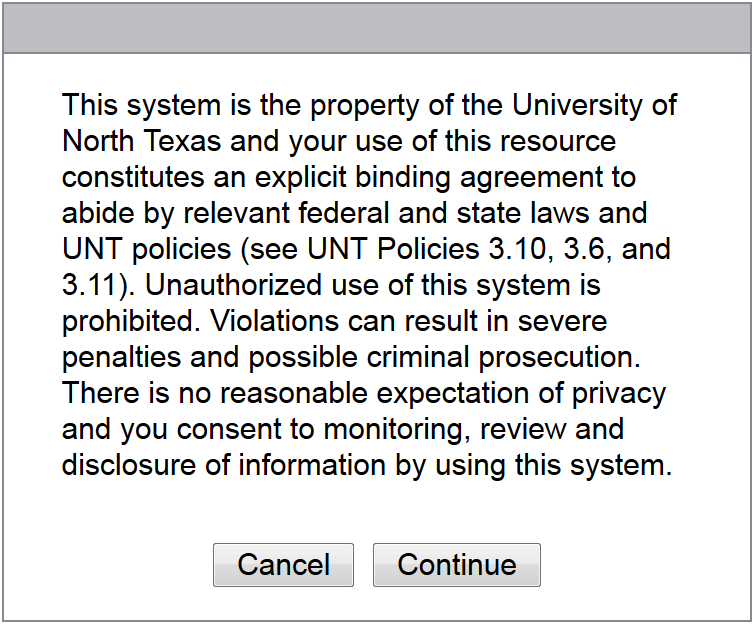 Enter vpn.unt.edu in the text box. Then, click Connect. 3. Enter your EUID and EUID Password. Then, click OK.
18 IPSec Client Configuration The IPSec client connects to the Campus VPN using the IPSec protocols. To download the IPSec client you need to go to: There you will need to enter in your EUID and password and select the client for your OS. 1. Launch VPN Client from either the Metro or the Start menu. 2. Click New. 19 3. Configure the following items. All items are case sensitive. Then, click Save. Host: vpn.unt.edu Name: General Password: untvpnaccess 4. Highlight the new connection entry and click Connect. 20 5. Enter your EUID and EUID Password. 6. Click Continue to agree to the UNT Terms and Conditions of Service. Once you click continue you will be connected to the Campus VPN. Just like the AnyConnect client your machine now has logical connection to the University of North Texas network. You will notice an icon in the bottom right hand of your task bar. This is the IPSec client icon and right clicking it will bring up the menu below. From there you can disconnect, show statistics or bring up the connection entry list again. 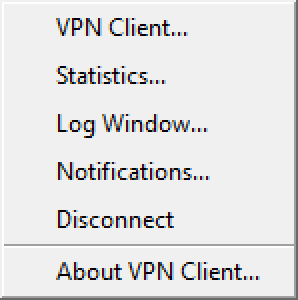 As stated above, once you want to log out of the Campus VPN you can bring up the menu above or bring up the connection entry list and click the disconnect button. The next time you need to connect to the Campus VPN just run the IPSec client and everything will be saved and ready to go. 21 Apple OS X Configuration This series of steps applies to Apple OS X Snow Leopard, Lion, Mountain Lion, or Mavericks. You will need an active Internet connection and administrator credentials to access the Campus VPN. 1. Access System Preferences by choosing it from the Apple menu or by opening it from your Dock. 22 2. Click Network. 3. Click on the plus sign (+) in the bottom left corner to add a new connection. 24 6. Configure the following items. Then, click OK. Shared Secret (case sensitive): untvpnaccess Group Name (case sensitive): General 7. Click Connect. 25 8. A prompt will appear. Configure the following items. 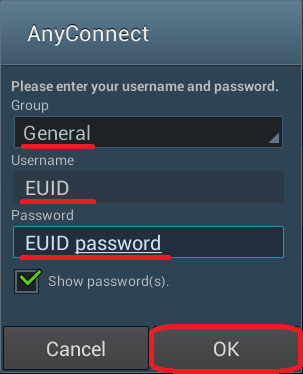 Then, click OK. Account Name: EUID Password: EUID Password 9. 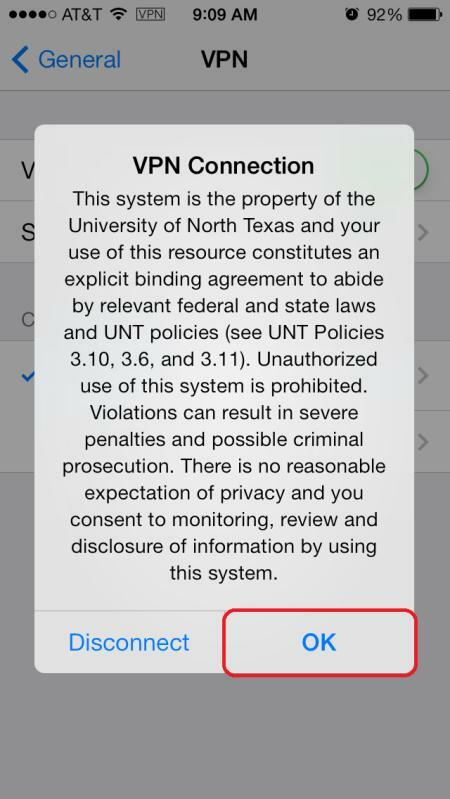 Read the UNT Terms of Service. Click OK if you understand and agree to the Terms of Service. 26 Android Configuration Most Android devices can also support a VPN connection using an app. 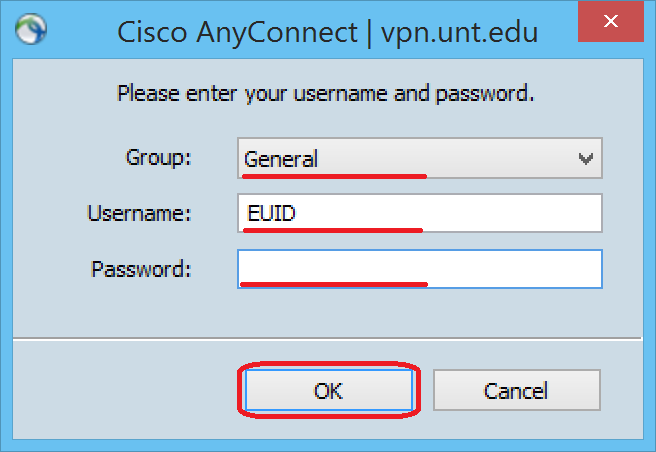 While there are a variety of apps which can effectively connect to the UNT System Campus VPN, this guide continues to use Cisco AnyConnect. To download and install the Cisco AnyConnect app, go to the Google Play Store and find the appropriate app for the device. =en Cisco AnyConnect ICS is a free app and requires Android or later. Not all manufactures of Android devices support ICS. 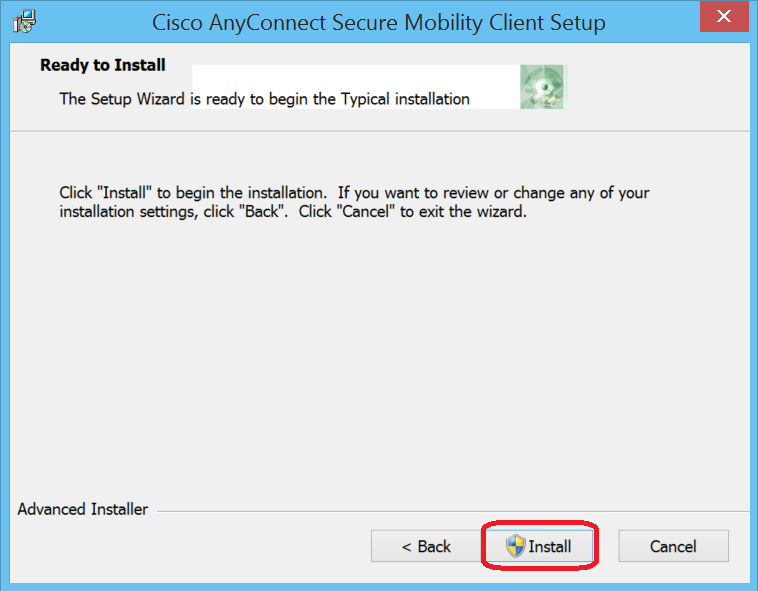 Cisco offers alternative versions for some Samsung devices and rooted devices. 1. Launch the Cisco AnyConnect Secure Mobility Client app. 2. Tap Add New VPN Connection. 27 3. Configure the following items. Description: UNT System Campus VPN Server Address: vpn.unt.edu 4. Tap Done at the bottom of the screen. 5. Tap on the UNT System Campus VPN button. 29 8. Tap Accept if you agree to the Terms of Service and finalize your VPN connection. 9. The main button will now appear green to confirm an active VPN connection. 10. To close the connection, swipe the green tab to the left. 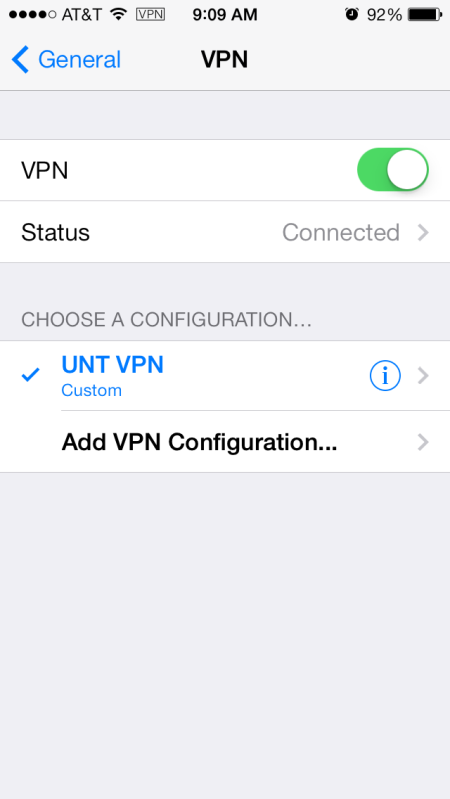 30 Apple ios Configuration This guide details setting up the UNT System Campus VPN using the built in ios VPN functionality. 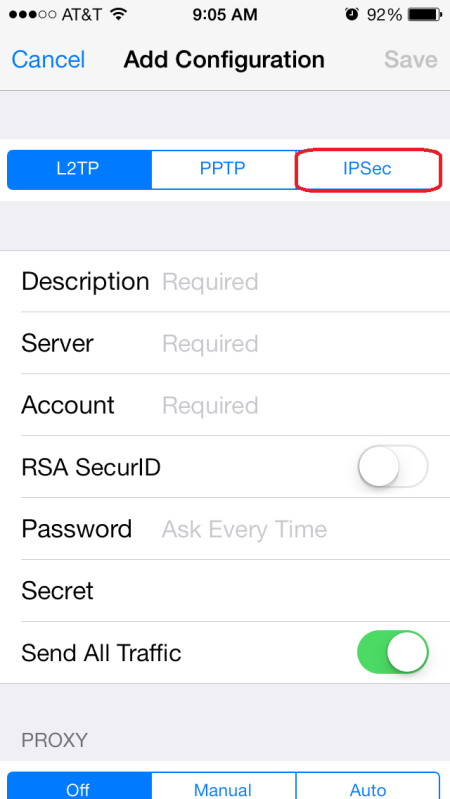 Alternatively, you may use the Cisco AnyConnect Secure Mobility Client app available for free in the Apple App Store. 1. 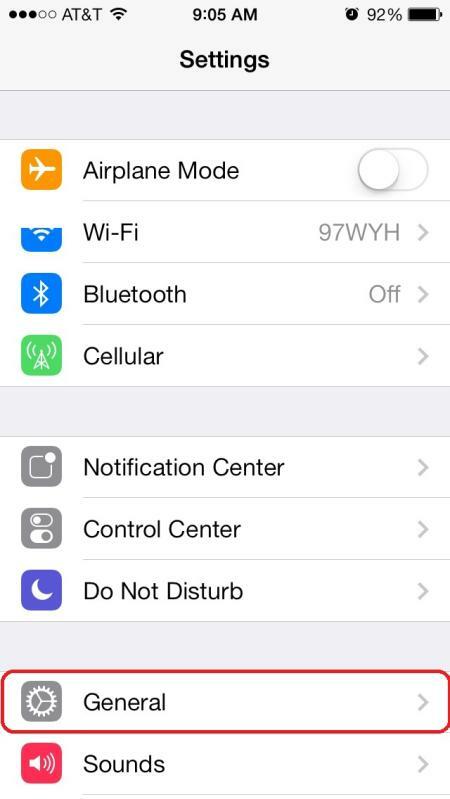 Tap Settings on your iphone / ipad / ipod Touch. 31 2. Tap General 3. 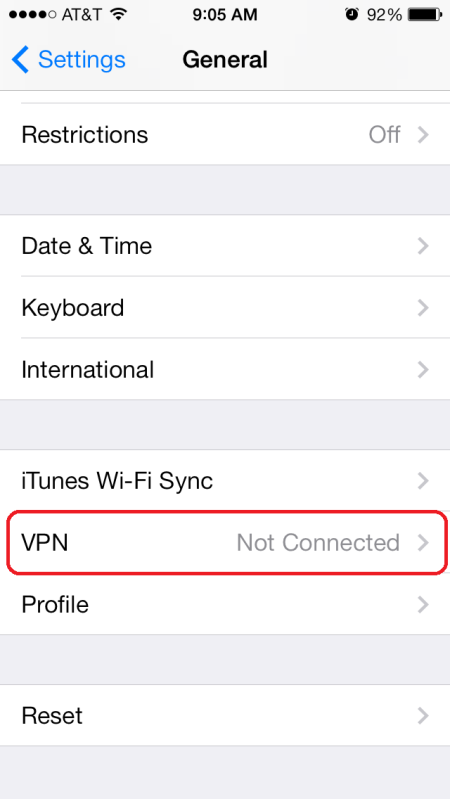 Tap VPN (some devices will have Network listed in the General menu, then tap VPN). 32 4. 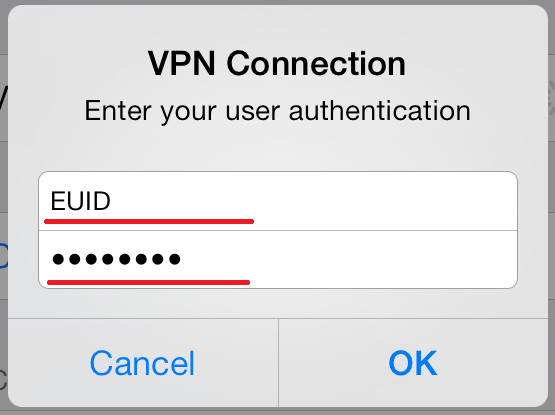 Tap Add VPN Configuration 5. Select IPSec from the options at the top of the screen. Mac: VPN and RemoteApp Detailed Guide Update: February 2016 What is RemoteApp? RemoteApp is similar to Remote Desktop in that it enables you to access programs using a Mac computer and using the MFDA VPN. 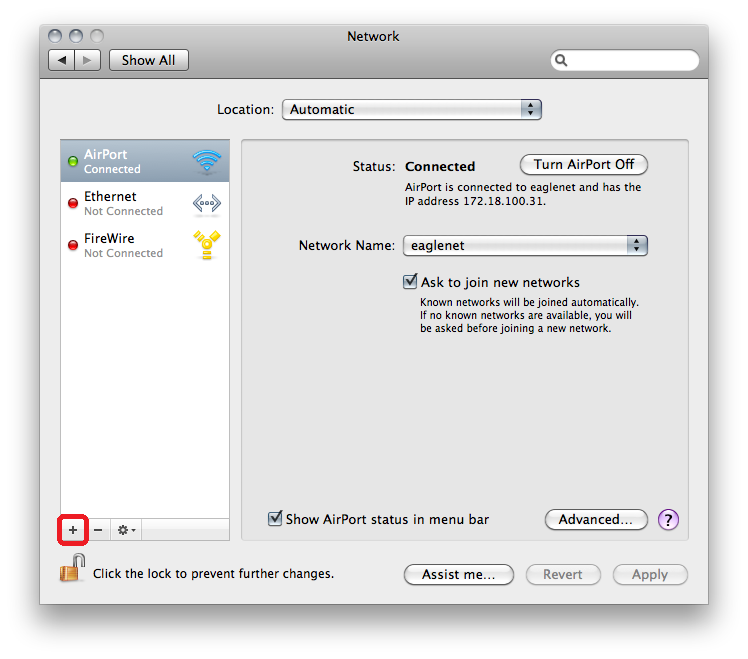 Print How to: Set up TTUnet VPN on your Mac in OS X Snow Leopard, Lion, Mountain Lion, or Mavericks Details: 1) Access System Preferences by choosing it from the Apple menu or by opening it from your Dock.